Today we are joining in the fun of the Gnome Matter What! Blog Tour Sponsored by Ink & Arrow. We are so excited to be joining all of these amazing bloggers in showing off this fabric line; and boy is it a cute one! I personally love gnomes and almost squealed with delight over the cute little garden friends in this fabric designed by Alicia Jacobs Dujets. 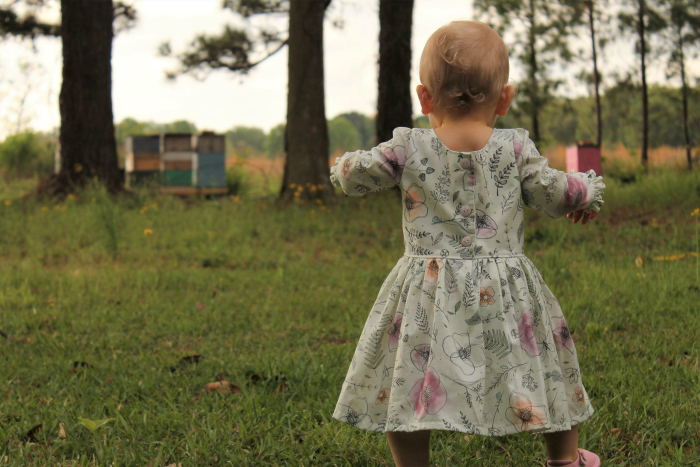 Weatherly and Brooke did an amazing job turning this fabric into gorgeous outfits for their girls. We hope you'll join us for the rest of the tour (complete schedule listed at the bottom of the post) and don't forget to enter the giveaway below for a chance to win a bundle of the fabric for yourself! Hello Everyone! It’s Weatherly from Love and Lilies Designs. I had the amazing opportunity to sew up some fabulous fabric from Ink and Arrows Fabric from their Gnome Matter What line. Let me tell you, it was not easy to pick fabric from this line because it’s all so fun, beautiful, and different! The colors are amazing and the whole line just reminded me of a soft spring/summer day in the gardens. Ultimately I chose the sketchbook garden and set vines in lilac. I’m a sucker for anything floral and purple! I knew exactly what I wanted to sew when I saw this line which was the Georgia and Pearl combo from Violette Field Threads. I have been dying to sew up these patterns but, I just never quite found the right fabric, until now that is!! I love the classic look of the Georgia dress with the sweetness of the Pearl pinafore over it. The fabrics are amazingly soft and sewed up like a dream! 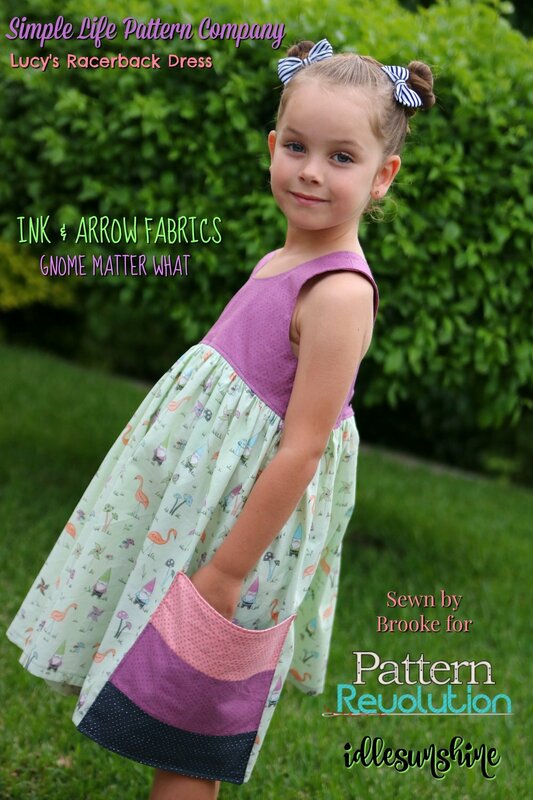 Gnome Matter What fabrics you pick from this line, you won’t be disappointed! Hi everyone, it’s Brooke here from idlesunshine! I’m thrilled to be joining the Gnome Matter What! tour on behalf of the Pattern Revolution team, highlighting the beautiful Ink & Arrow fabrics from the Gnome Matter What collection. I absolutely adore the colours and prints in this collection, they are so soft and sweet! It was a super tough decision when choosing fabric for this project. I was really tempted by the florals, but with a name like Gnome Matter What, I really had to go for the Gnomes! I wanted to make a dress that could highlight several prints, so I decided on the Simple Life Pattern Company - Lucy Racerback Tunic & Dress. I knew my girls would love the racerback design, and those big pockets gave me something to play with! I made this to fit my eldest daughter (who is really not much bigger than my youngest), so I planned to give it a cooler look, by including the purple and black in the print. Then when they both saw this fabric and the dress coming to life, they battled it out and the baby won!! When the rain cleared one afternoon, we headed down the road to our beautiful neighbour’s home, because we could see her out the front sweeping her path. She was so excited for us to take pictures in her garden, which is absolutely stunning and so beautifully maintained! We often stop to chat because she is always outside in her yard. If you'd like to claim your chance to win a bundle of the Gnome Matter What! fabric, you can enter with the rafflecopter below. The giveaway starts at midnight, Monday, April 3, and ends at midnight, Wednesday, April 12. The winner will be notified by email and will have 48 hours to claim their prize.